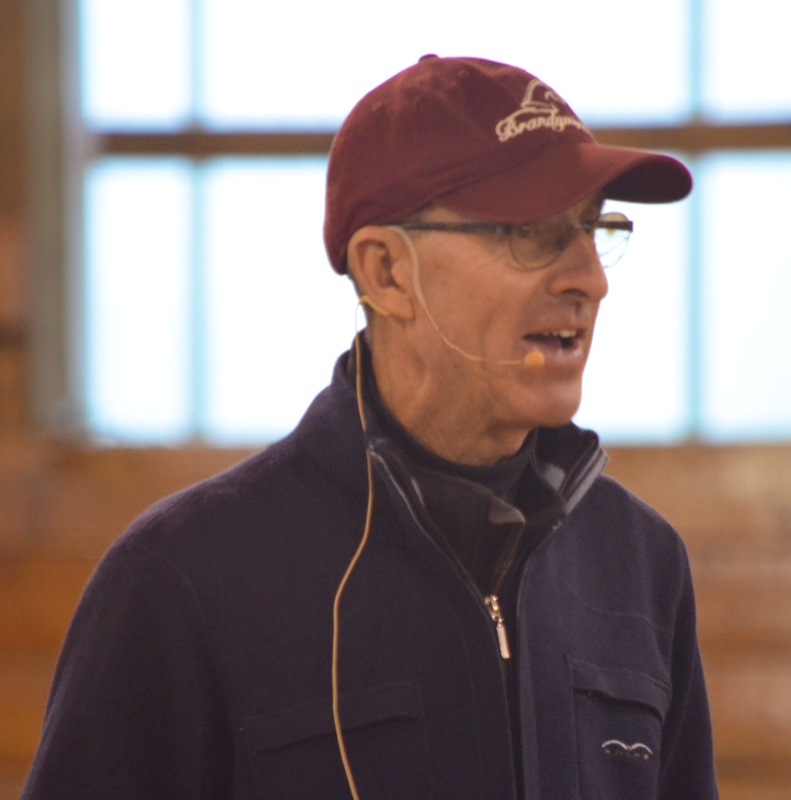 Antioch, IL – November 22, 2014 – Annali-Brookwood Farm hosted the Geoff Teall clinic this weekend. Almost thirty riders were put through the paces as Teall stressed the importance of basics. Auditors had the perfect view from ringside seats and audit fees were donated to the United States Hunter Jumper Foundation, which Teall is a co-founder of. Hosts Rush and Caroline Weeden provided a warm, beautiful facility along with plenty of hot coffee and delicious food for a great time while giving back to the industry. The clinic was for riders of all levels and included groups for ponies, children’s/adult riders, equitation riders and junior amateurs. Teall, of Wellington, FL, is a USEF “R” judge who has judged such notable shows as the National Horse Show, the Washington International Horse Show, the Winter Equestrian Festival, the WIHS Equitation Finals and the 2007 USEF Medal Finals.. Teall was honored with the 2006 Volunteer of the Year Award and the Chronicle of the Horse Show Hunter Horseman of the Year. Teall emphasized basics, slow work, respect for the horse and appreciation for the sport to the riders, no matter what level they ride at. The USHJA Foundation is a non-profit organization supporting the needs of the USHJA with program development, history preservation, education and the horseman’s assistance fund. The event raised approximately $1,000 in audit fees as a donation to the foundation. Annali-Brookwood Farm will host the George H. Morris riding clinic November 28-30, 2014. Twenty-four riders will have the opportunity to ride with the former United States Chef d’Equipe at heights of 1.10m, 1.25m and Grand Prix. Auditors are welcome – sessions start at 9:00 am to approximately 5:00 pm. Devoucoux saddles sponsoring lunch each day. Brookwood Farm is a successful training facility with many National wins to their credit. Rush and Caroline Weeden, both USHJA Certified Trainers, have trained many horses to USEF Horse of the Year Awards in addition to supporting the industry. Caroline serves on the board of the USHJA Foundation, the World Championship Hunter Rider Committee, the High Performance Hunter Committee and is President of Chicago Equestrians for a Cause. The couple also supports the industry by holding numerous National events at their Annali Farm including the George H. Morris Gladstone Program, The Chicago Hunter Derby and the George H. Morris Chicago Clinic. They also organized and hosted the 2012 Emerging Athletes Program Finals. For more information on Brookwood Farm, contact Carl at 847-951-0826 or Rush at 847-951-1148. You can “Like” them on Facebook at Brookwood Farm. For more information on the George H. Morris clinic, contact co-ordinator Diane Carney at 847-922-6167 or dtelluride@aol.com. For more information on the USHJA Foundation or to make a donation, please visit www.USHJAfoundation.org.